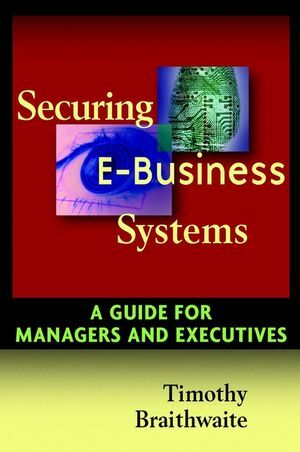 Securing E-Business Systems provides business managers and executives with an overview of the components of an effective e-business infrastructure, the areas of greatest risk, and best practices safeguards. It outlines a security strategy that allows the identification of new vulnerabilities, assists in rapid safeguard deployment, and provides for continuous safeguard evaluation and modification. The book thoroughly outlines a proactive and evolving security strategy and provides a methodology for ensuring that applications are designed with security in mind. It discusses emerging liabilities issues and includes security best practices, guidelines, and sample policies. This is the bible of e-business security. Timothy Braithwaite (Columbus, MD) is Deputy Director of Information Assurance Programs for Titan Corporation. He has managed data centers, software projects, systems planning, and budgeting organizations, and has extensive experience in project and acquisition management. He is also the author of Y2K Lessons Learned (Wiley: 0-471-37308-7). TIMOTHY BRAITHWAITE has spent more than fifteen years in senior security management positions and another twenty years in executive director positions for computer and communications services organizations in both the public and private sectors. He has also worked as a private consultant. Tim has previously published The Power of IT: Maximizing Your Technology Investments and Evaluating the Year 2000 Project: A Management Guide for Determining Reasonable Care (Wiley). Chapter 1 Electronic Business Systems Security. How Is E-Business Security Defined? Can E-Business Security Be Explained More Simply? Is E-Business Security Really Such a Big Deal? Is E-Business Security More Important Than Other Information Technology Initiatives? Instead of Playing "Catch-Up," What Should an Organization Be Doing to Design E-Business Systems That Are Secure in the First Place? Chapter 2 E-Business Systems and Infrastructure Support Issues. A Short History of E-Business Innovations. The Need for Secure E-Business Systems. Software: The Vulnerable Underbelly of Computing. The Interoperability Challenge and E-Business Success. E-Business Security: An Exercise in Trade-Offs. Few Systems Are Designed to Be Secure. Chapter 3 Security Weaknesses in E-Business Infrastructure and "Best Practices" Security. The Guiding Principles of Protection. "Best Practice" Prevention, Detection, and Countermeasures and Recovery Techniques. x Chapter 4 Managing E-Business Systems and Security. Part One: Misconceptions and Questionable Assumptions. Part Two: Managing E-Business Systems as a Corporate Asset. Part Three: E-Business Security Program Management. Chapter 5 A "Just-in-Time" Strategy for Securing the E-Business System: The Role for Security Monitoring and Incident Response. The Current State of E-Business Security. Standard Requirements of an E-Business Security Strategy. The Crucial Role of Security Monitoring and Incident Response to the Securing of E-Business Systems. The Current State of Intrusion Detection Systems (IDS). Defining a Cost-Effective Security Monitoring and Incident Response Capability. Alternatives to Building "Your Own" Security Monitoring and Incident Response Capability. Chapter 6 Designing and Delivering Secured E-Business Application Systems. Choosing a Systems Development Methodology That Is Compatible with the SDR Framework. Participants in the Identification of Security and Integrity Controls. A Cautionary Word About New Technologies. Chapter 7 Justifying E-Business Security and the Security Management Program. Benefits Justifications Must Cover Security Program Administration. Chapter 8 Computers, Software, Security, and Issues of Liability. How Might a Liability Case Unfold? Questions to Be Asked to Ensure That Reasonable Care Has Been Taken in Developing a Secure E-Business System. Chapter 9 The National Critical Infrastructure Protection (CIP) Initiative. Critical Infrastructure Protection (CIP) Purpose, Directives, Organizations, and Relationships. Frequently Asked Questions About the IT-ISAC. Critical Information Infrastructure Protection Issues that Need Resolution. Appendix A: Y2K Lessons Learned and Their Importance for E-Business Security. Appendix B: Systems Development Review Framework for E-Business Development Projects. Appendix C: A Corporate Plan of Action for Securing E-Business Systems (Sample). Appendix D: E-Business Risk Management Review Model Instructions for Use.